Bookings for a minimum 3 days may be accepted, priced on a per day basis + cleaning and service. 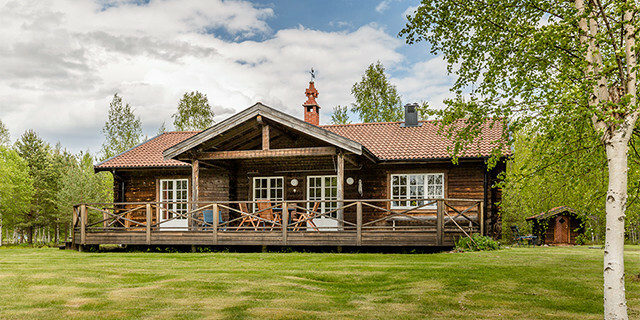 You will find yourself on the island of Sollerön, surrounded by Lake Siljan, close to Mora in the heart of Dalarna. This is a part of Sweden steeped in history and tradition and famed for its nature, beauty and music. We are located in the forest with an uninterrupted view of the lake, where your neighbours are often a passing deer, a hopping hare or our friendly woodpecker. Enjoy a stroll in the forest, pick berries & mushrooms, swim or canoe in the lake or simply recharge in the long sunshine hours of a Swedish summer. For those seeking sport or adventure there are many walking, cycling, orienteering and skiing trails, a variety of on lake activities, golf and much more. All close enough to feel near yet far enough not to disturb the tranquillity of the location.